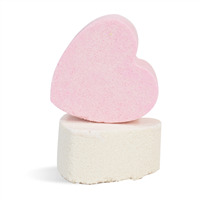 Hand craft these bath fizzies for children and adults who love Sweetarts. Package five differerent colored guest sized fizzies in a cello bag to create this sweetie tarts look! 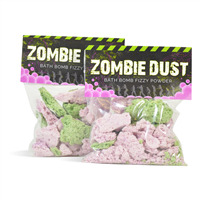 This project allows you to make purple yellow, orange, green and pink bath fizzies. Give this to your sweetie for Valentine's Day or maybe give this to a child around Halloween as an alternative treat to sugar and candy. You Save $26.70 by purchasing this kit rather than buying the items separately. 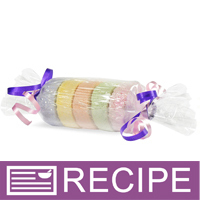 COMMENTS: The Sweetie Tarts Bath Fizzie Kit had good instructions and was fairly large in size. I wasn't expecting the outcome to be as big as it was (just under 1/2 pound total). I liked that it was a hefty Bath Fizzie and individual ones at that. They smelled delicious! The adults & kids who received them both said they couldn't get enough of how fun there are! I didn't like how the molds were hard to use and get the fizzies out and that I needed to alternate the recipe a little bit due to I couldn't get them to stick together without cracking. COMMENTS: I really like this kit and the value is good too. I strayed from the instructions slightly by making one color batch at a time. Overall, nice kit with easy to follow directions. These will make great gifts or retail items. "Very cute, but instructions could be more clear." COMMENTS: First, these are CRAZY cute and smell wonderful. The recipe is really easy to follow... however it should be noted that this kit only comes with one- 6 fizzie mold. So you need to be aware that you will need to do one color at a time. You must leave the fizzies in the mold until they completely harden which depending on where you live, could take hours. You have to do this 6 times with each different color. This project took me several hours over the course of 2 days to complete all 6 colors with the one mold included with the kit. I ended up buying some 2" round PVC pipe and cutting them into one inch high "molds" so that I could complete the all 6 colors of the sweet tarts in one day. I would recommend doing something like what I did, or buying multiple molds. Other than that, these are adorable! • Scent, packaging, great idea! 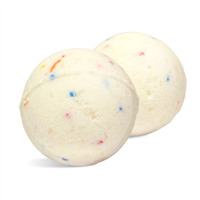 "will these color the bath water.."
Staff Answer Yes they do!